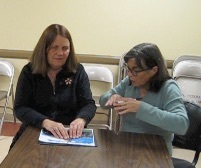 Many museums understand hands-on activities are a good way to gather information about exhibits. Tactile tables are often set up in the exhibit halls so that people can touch parts of complex displays. This makes parts of the object available but frequently the entire piece is still out of reach. Today’s blog post shows ways to connect the parts to the big picture. We used the Sensational BlackBoard to create the tactile raised-line drawings in these videos. To learn how to use the Sensational BlackBoard or to purchase a board click here. This video is a step by step demonstration of how to break down a picture into easily understood segments of information for tactile access. Julie Deden, director of the Colorado Center for the Blind, joins me. Click here. 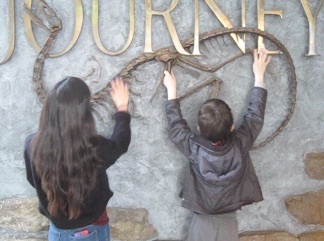 This video captured our tour of the Denver Museum of Nature and Science. We interacted with the Sensational BlackBoard, an iPhone, the museum’s touch tables, their wonderful volunteers, and expert paleontologist Catherine Sartin. Click here. In this audio interview Dr. Simon Hayhoe talks about his teaching and research in schools and museums around the world. He covers a lot of information in this 20 minute talk about how cultural expectations can limit our access to artistic expression. Written transcription is posted below. Blind Creations Conference is a three-day international conference and micro arts festival,which will take place between 28 June and 30 June 2015, seeks to explore the relationship between blind people and artistic creation. Follow this link to see Jenny describe her work. 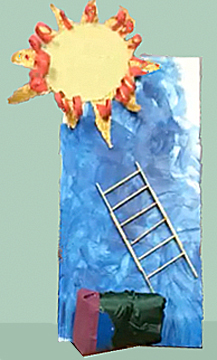 Ahimsa’s self-portrait shows a bed at the bottom, a sun at the top, with a ladder spanning the sky blue space in between. Click here. 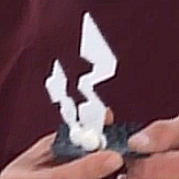 J identifies with his initial J as lighting bolts. Hear him talk about it. Today I will be talking to Dr. Simon Hayhoe. I am interested in talking to him because of the research he’s been conducting that explores how cultural beliefs shape people’s understandings and attitudes about what they expect from themselves, as well as others. Simon, could you please introduce yourself and tell us how you’ve been researching these issues. My name is Dr. Simon Hayhoe. I’m from Canterbury, in Kent, which is in the U.K., and Canterbury, as in Chaucer’s Tale, and Canterbury Tales. I’m a senior lecturer at Canterbury Christ Church University and I lecture in the school of Childhood and Education Sciences. And I’m also a Centre Research Associate in the Centre for Philosophy of Natural and Social Science, at the London School of Economics, which isn’t too far luckily enough. I’ve been researching blindness and arts, and blind people’s art, and why blind people create and paint and are imaginative. For probably 21 years now, 22 years this year, 1993 is when I did my first project. I’ve written 3 books on the subject, and several articles, I’ve lectured in 3 different countries. Back in 2011 I was also a Fulbright Scholar. I was doing a research project at the Metropolitan Museum of Art, understanding how blind people understood paintings, and why blind people wanted to visit art galleries. So that’s really my motivation. Over 20 years ago now, I was looking at my first book, I started looking at art studios and particularly adults who’d never painted or drawn before, and they were completely blind. And they’d been to schools for the blind, and had negative expectation put on them. And they’d never realized that there was such a thing called art. It had not been taught to them. And I felt this was unusual because I was just looking at how people understood art with a normal context. It just happened to be, I was in an art studio, with a group of adults with a bunch of disabilities, and it turned out that there was a group of blind students who had absolutely no experience. So I thought to myself, well, this is unusual, because how can you have absolutely no experience of art, and what does it mean to have no experience of art? Because as a sighted person brought up in the sighted world, I couldn’t understand that myself. There were other blind people in the class who had the same levels of blindness, yet because they’d been blind later in life, they had lots of experience of art. And so, that was unusual to me that the people who were doing art, if you like, who were blind, had plenty of experience of art previously, and thought there was no problem or no issue in them doing or having an experience of art after they were blind. And this was a big difference between those people who were very blind from birth, or blind from a very young age. I thought, there must be some problem, there must be some problem with our education system, because it’s actually teaching children at a very young age that they can’t actually experience art. So I looked at, after that, people who were successful and who were blind, becoming painters and people who were draftsmen, and draftswomen, and sculptors. And I wanted to find out why they, rather than the people who’d had no experience with blindness, could do art and have this vision that they could do art. And also understand how a blind person could understand art. And that led me into many, many, many years of research, and it ended up at looking at a thermal imaging at Metropolitan Museum of Art back in 2011. What I found was that blind people can create analogies. And this isn’t just in traditional visual art, it’s also in computer programming, because another study I did which was parallel to my previous studies of art, was looking at how blind people understood a two-dimensional interface. Now this was something that was particular to me because everyone understands the blind, or lots of people think, anyway, that blind people can’t understand art. I’ve never understood that position, but many people do have that understanding. And it does tend to get into our teaching, and it tends to get into our theorization about blind people, as well. But I’ve always understood that blind people could program computers, and there’d never been any dispute about this because this was almost a traditional job that blind people could actually undertake. So I thought to myself, why is it that we think that blind people can program computers, but they can’t paint and draw? Even though, if you think about it, computer interfaces are far less tactile and far less 3-dimensional than an artwork, than a piece of sculpture, than a painting. Again, it comes down to cultural understanding and cultural background. Give the word ‘art’ the word ‘visual’, and suddenly you think, oh, blind people automatically can’t do it. Give the word ‘interface’ to a ‘computer’, and people think, oh well, of course blind people can’t understand. But those are very interesting parts of computer programming as well that I found. That in the old days, of course, we used to code with plain code. Nowadays, we code with visual code, and as soon as we added that word ‘visual computer programming’ to programming, everyone then suddenly thought that blind people couldn’t program. And so, in the study I conducted, I’d find that people who’d lost their sight from a very young age, again, who’d been to schools for the blind, again, couldn’t – or thought that they couldn’t – understand visual computer imagery, and started not producing visual computer programs, if you like. Whereas people who became blind later in life still thought that they could produce computer programs and computer interfaces as they had when they had sight. There were a couple of people who didn’t think that way, I mean there are some blind people who do actually program visually and they have been blind from birth. But they’re very rare cases. And of course, as we know, people like Esref Armagan are cases of people who can – or who believe they can, certainly – paint and draw, and certainly produce very good, very imaginative pieces. And these are pieces that a sighted person would struggle to create sometimes. We understand that it is actually possible for a blind person to actually paint and draw. So why is it that some people go through life believing they can’t, and in some cases I’ve found, were even afraid of touching clay when they were put into art studios, first of all, because they’d never been exposed to art education. So, I looked at the motivations because that became fascinating to me. I broke into two strains of research. The first one was looking at the philosophy of why we believe blind people can’t understand visual imagery. And the second piece that I looked into was why do blind people who were blind from birth believe they can paint and draw, or create a computer program? Funnily enough, the only examples I could find, either hadn’t had education when they’re younger, as in the case of Esref Armagan, who actually used drawing in 3 dimensions, that is drawing with clay, and drawing by scratching a pencil or a stick into a cardboard image to actually make a raised line, if you like. They’d actually used art to understand the world, because they had no other formal education. He didn’t just want to understand the tactile world, he wanted to also understand the visual world, as well. So, he’d scratched in outlines of images, but then he wanted to know, well, everyone was describing through language, “there’s a mountain over there”, “there’s a piece of water over there”, “there’s a tree over there”, and “if you look at a tree, it looks smaller in the background than it does in the foreground”. Now, to a blind person such as him, he wouldn’t have understood that concept. So, he asked to have it explained to him. Explained through language, he could then understand it. As his imaginative, own abstract concept. It’s just as when we’re learning to draw, and when we’re taught about perspective. And this is where, for example, instruments like your perspective machine, your perspective tool comes in. Where you’re actually explaining to people about perspective. And this is just the normal process that a sighted person would go through. And so, because of that, he was starting to understand the world around him in a visual realm. Because of course, blind people, as everyone else, live in a visual culture. And they want to understand the realm of the language that’s used around them. So he was trying to just make sense of his world through art. As all people are doing. So, in a way, we learn about art as well, through the way that blind people learn about art. Because they’re just trying to make sense of their world and we’re trying to make sense of our world through art. One of the things I do in my lectures, as well – and if you look at the Power Point, if we have a link to the Power Point – is I always start when I teach my students about creativity, imagination. And again, I don’t specifically refer to just blindness, and just creativity by blind people’s sculptures, and drawings and paintings by blind people. I refer to all forms of sculpture and painting and drawing. But when I try and teach students about this, I always start off with a question, “What is possible for people to understand”? I always show them the first picture in that Power Point, which is a picture of, well, two paintings by Esref Armagan. And I start off by showing them, there’s a painting with fish playing a violin. And then I show them a picture of a mountain scene with a mountain in the background, a lake, two houses, a small house behind a larger house, showing what we call in visual art foreshortening. And I ask them, “Well, if you were to show this to a blind person, how would a blind person understand it”? Many of my students think, well, to start off with, you get the normal response. Which is, and it’s completely fair, because you know, this isn’t against my students, certainly, because anyone would say it if they had no experience in this field. “Well, I don’t know, maybe I could explain the fish to a blind person because they may have felt a fish. They may have felt water. So, I could explain the water. They may have understood a butterfly or a flower, because they felt and experienced and smelled those. But I would have trouble explaining the colors to this person. I would have trouble explaining the mountain gets smaller the further away you see it. I would have trouble explaining that there’s a smaller house behind a bigger house, but it’s still the same size, it’s just perspective. But of course, then I do the big reveal, and I show that this is actually by a blind person. And this is where my students become very surprised. And then we start our discussion about what is really possible for anyone to achieve in art. Because the first response my students usually give me when they first walk into my class is, “Oh, I’m not creative”, “I can’t do the project because I can’t create”, “No one’s creative”, or “These people over here are creative, but I’m not creative”. The first thing I say to them is, “Everyone’s creative”. It’s a bit like saying you don’t have a nose, or you don’t have eyes. Everyone is creative. You have those things. You know, whether you use them to see or smell is your business. But you are creative. You may not realize it, but you just have those things. And so, it’s how we use our understanding of creativity, and what we were taught, or how we were taught we weren’t creative, because maybe we pencil drew when we were younger and it didn’t look exactly like the object it was supposed to look at. So people then say, “Oh well, you’re not that good at art, maybe, as you’re supposed to be. So, you’re not that creative”. So what I try and teach is, that everyone can be imaginative. For example, Esref wasn’t taught by a fish playing violins, he just has in his own mind, fish playing violins. He didn’t have the lake and the mountain and the background and the figurative imagery and that painting as part of his understanding of his teaching, he wasn’t taught of painting exactly. He imagined that painting. So, for a person who’s never seen before, who was born without any form of light perception whatsoever, can imagine that in his brain, then why can’t sighted people imagine similar things in their brain? Everyone is imaginative, everyone is creative. Well, I think the root of art, and lots of people have discussed and philosophized about why we paint, why we draw, what is the point of art. I think this has gone back to the ancient Greeks. I mean, it’s a big question. But for me, art is a way of understanding our world. We shouldn’t be restricted by thinking, am I doing art well? Am I being a creative person? Am I being creative enough? Because these are things that have been trained into us when we’re children. These are things we’ve been trained into even before we go to school.You’re good at art, you’re bad at art. That either looks like something or it doesn’t look like something, if you’re drawing or painting something. It doesn’t matter whether it looks or doesn’t look like something. When you’re playing, you’re just rehearsing your life, you’re just building up an image of the world around you in your life. And the same thing is creative activity. You don’t actually need to be able to paint or draw, you can make anything. As I try with my students, I try to get them to do self-portraits that aren’t actually drawings. They’re based on their memories. So, for example, our “Four Senses” project gets them to think about memories from when they were children, gets them to think about the smells they had, the tastes they had, the sounds they heard, the touch that they remember, their favorite form of touch. And they come in and they bring in tactile objects, and objects that smell, and objects that taste in a certain way that remind them of their childhood. And I think this is all about, this is what art is. It’s remembering who you are, it’s building up your own personality, it’s understanding the culture around you, it’s understanding who you are as a person. And I think this is why art is a very powerful tool. Not only as a way of displaying yourself on a wall, and saying ‘this is who I am’, or displaying yourself in a gallery, and saying ‘this is what I’ve made’. But in particular, it’s a way of thinking about who you are in terms of yourself. It’s intrapersonal intelligence, as you would say in terms of multiple intelligences. As well as being interpersonal intelligence, communicating who you are, communicating who you want to be. It doesn’t matter if you’re any “good” at it in certain ways, in inverted commas. You know, if you’re communicating yourself, you’re communicating yourself. It doesn’t matter whether someone understands that perfectly, you’re still making that communication, you’re still putting that thought across. Thank you, Simon. Your work inspires me. 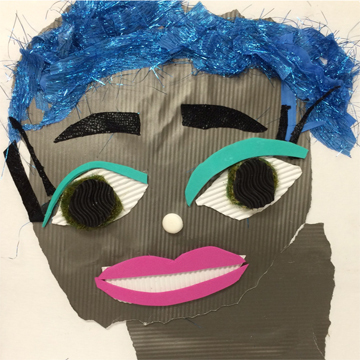 So much so, that I asked my art class at Colorado Center for the Blind to make some self-portraits. I’ve posted 3 short video clips of these students talking about their experience. Simon, thanks again for sharing your ideas and insights with us. If you are interested in learning more about Dr. Hayhoe’s work, you can follow the links posted on this blog. I even got to say a few words!